Was the Carroll Country Resource Council behind Smoke-Free Soccer? That was the message of young peer presenters and role models in Arkansas Smoke-Free Soccer, which was authored and led by the Carroll County Resource Council. Initially funded by the U.S. Centers for Disease Control, Smoke-Free Soccer was the brainchild of a former assistant to the U.S. surgeon general, Ripley Forbes. It was funded nationwide by the CDC but tweaked in Arkansas to feature youth peer-presenters. After CDC funding ended, Arkansas Smoke-Free Soccer continued with grants from the EPA and the Arkansas state tobacco settlement. The Arkansas program steered away from hiring experts and motivational speakers for kids' rallies. Instead, we believed that teenage leaders leading participants in hands-on soccer skills clinics -- with games that had a message -- would be far more effective. Independent evaluators agreed with us. Our athletes, primarily Berryville and Green Forest soccer players, led younger kids statewide in games that instilled anti-smoking messages and taught peer-pressure resistance skills. Pre- and post-tests showed that our teens were very effective in changing attitudes. Our young instructors gained leadership skills and earned small stipends that empowered them to attend soccer summer camps, play on Arkansas State Select Teams in the Olympic Development Program and compete on Arkansas Comets premier soccer teams in Fayetteville. them to win. So, I can't smoke! 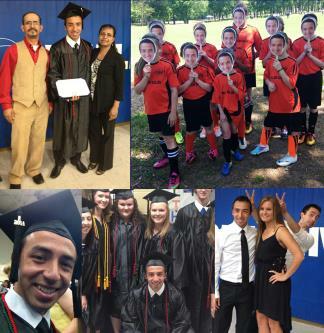 We could not be more proud of Henry Pineda, who just graduated from Williams Baptist College on a soccer scholarship -- and was a peer presenter in our Smoke-Free Soccer outreaches funded by the U.S. Centers for Disease Control. Resource Council's role in Smoke-Free Soccer? Portland, Maine, and Mesa, Arizona. We showed the videos, then our youngsters demonstrated how to use soccer to teach prevention messages during sessions at National Soccer Coaches Association of America conventions in Kansas City and Providence, R.I.